Unabashed Book Promotion: My Memoir, SPLIT is Here! Sexual Abuse Rings Flourishing Because They’re Good for Business? Is the Catholic Church Stance on Gays Changing? Former nun Mary Dispenza is an advocate for those abused by priests. 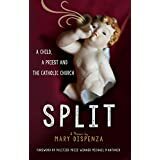 Her memoir, SPLIT: a child, a priest and the Catholic Church, chronicles her own abuse, her years as a nun and her search for healing from trauma and shame.